In 1936, you had three choices: National Socialism, international socialism, or dignity. In 2018, we find ourselves in similar circumstances… Why is this happening now…? First, we scholars have failed to convince the public of just how wicked all forms of communism were and remain. …Almost all historians ignore the most salient fact of the 20th century: that governments murdered more than 200 million innocents, the largest massacre in the history of the world. Terror reigned in the killing fields, the Holocaust camps, and the gulags. …Second, an entire generation has grown up never knowing such things as the Soviet gulags or even the Berlin Wall. …most younger defenders of communism buy into the oldest propaganda line of the Left—that real communism has never been tried. That the National Socialists embraced socialism is factually accurate. …they did nationalize very vital industry in Germany, even if by outright intimidation rather than through the law. In his personal diaries, Joseph Goebbels wrote in late 1925: “It would be better for us to end our existence under Bolshevism than to endure slavery under capitalism.” Only a few months later, he continued, “I think it is terrible that we and the Communists are bashing in each other’s heads.” Whatever the state of the rivalry between the two camps, Goebbels claimed, the two forces should ally and conquer. …The Italian fascists had even closer ties to the Marxists, with Mussolini having begun his career as a Marxist publicist and writer. A few Italian fascists even held positions in the Comintern. …how do we react to the hammer and sickle? I don’t have to write an article explaining the millions of deaths that occurred at the hands of communist regimes; like the Holocaust, the gulags of the Soviet Union and killing fields of Cambodia are widely known. Yet journalists in the UK openly and proudly advocate communism. Statues of Karl Marx are ere cted. 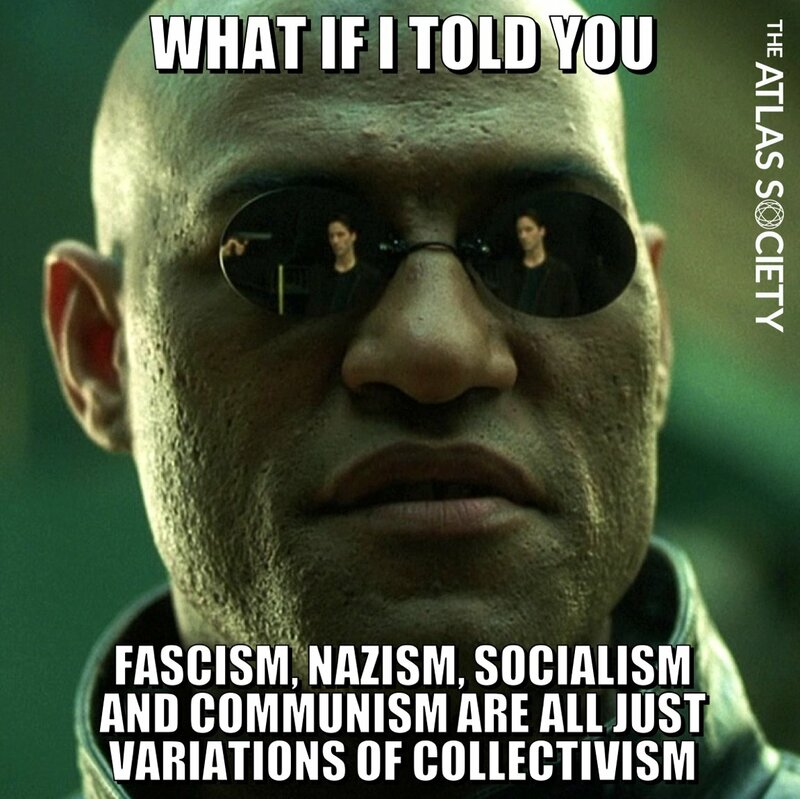 …there is no justifiable way a fascist could argue ‘That wasn’t real Nazism.’ The same is not true for communism. …Since Karl Marx never implemented communism himself, the leaders of communist states always have that get-out-of-jail-free card. 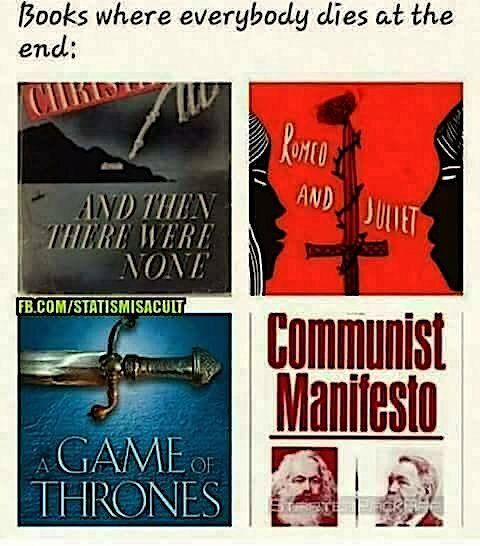 Any shortcomings, tragedies, or crises a communist regime faces can always be blamed on a misapplication of Marx’s infallible roadmap… The communist ideology in its purest form might be separated from its implementations, but at what point does its awful track record discredit any attempts to advocate it? …The history of communism is as bloodstained as that of Nazism; much more so, actually. It’s time we treated it as such. …Entrepreneurship was abolished. State ministries, rather than consumers, determined what was produced and under what conditions. …Fascism is to be distinguished from interventionism, or the mixed economy. Interventionism seeks to guide the market process, not eliminate it, as fascism did. …Under fascism, the state, through official cartels, controlled all aspects of manufacturing, commerce, finance, and agriculture. Planning boards set product lines, production levels, prices, wages, working conditions, and the size of firms. Licensing was ubiquitous; no economic activity could be undertaken without government permission. …“excess” incomes had to be surrendered as taxes or “loans.” …since government policy aimed at autarky, or national self-sufficiency, protectionism was necessary: imports were barred or strictly controlled…fascist governments also undertook massive public-works projects financed by steep taxes, borrowing, and fiat money creation. The Marxians have resorted to polylogism because they could not refute by logical methods the theories developed by “bourgeois” economics, or the inferences drawn from these theories demonstrating the impracticability of socialism. As they could not rationally demonstrate the soundness of their own ideas or the unsoundness of their adversaries’ ideas, they have denounced the accepted logical methods. …The German nationalists had to face precisely the same problem as the Marxians. They also could neither demonstrate the correctness of their own statements nor disprove the theories of economics and praxeology. Thus they took shelter under the roof of polylogism, prepared for them by the Marxians. Of course, they concocted their own brand of polylogism. …Neither Marxian nor Nazi polylogism ever went further than to declare that the logical structure of mind is different with various classes or races. …Polylogism is not a philosophy or an epistemological theory. It is an attitude of narrow-minded fanatics. Well, we now know what happens when someone learns about the common characteristics of statist ideologies. The Daily Caller has a report on a student who got very upset after learning that the National Socialist Workers Party was…yes, socialist. How high does the death toll need to get before people realize that communism, like its sister ideology of Nazism is despicably evil? There’s a long and sordid history of people in Western nations acting as dupes and apologists for communism. This is especially the case with the wretchedly impoverished totalitarian outpost 90 miles south of Florida. President Obama lauded aspects of Cuba’s totalitarian regime when he visited in 2016. Jeffrey Sachs ranked Cuba higher on development goals than the United States. Jimmy Carter (and Jeremy Corbyn, Justin Trudeau, etc) gushed about Fidel Castro when the long-time dictator died. 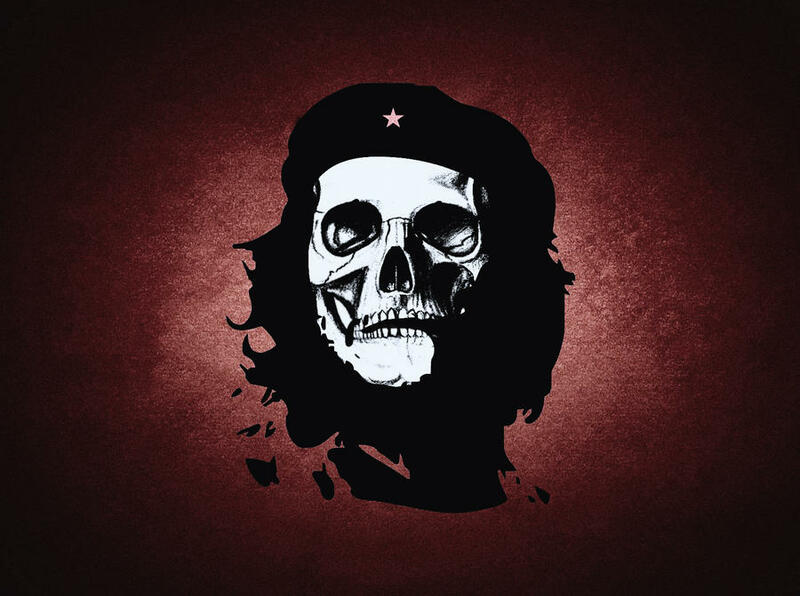 Numerous vapid celebrities have helped turn the thuggish and racist Che Guevera into a pop icon. Kristof admits in his piece that there are critics who don’t believe the regime’s data, but it’s clear he doesn’t take their concerns seriously. And he definitely doesn’t share their data. So lets take a close look at the facts that didn’t appear in Kristof’s column. My first recommendation is to watch Johan Norberg’s video on the real truth about Cuba’s infant mortality. Jay Nordlinger authored the most comprehensive takedown of Cuba’s decrepit system back in 2007. Here are some of the highlights. The Left has always had a deep psychological need to believe in the myth of Cuban health care. On that island, as everywhere else, Communism has turned out to be a disaster: economic, physical, and moral. Not only have persecution, torture, and murder been routine, there is nothing material to show for it. The Leninist rationalization was, “You have to break some eggs to make an omelet.” Orwell memorably replied, “Where’s the omelet?” There is never an omelet. …there is excellent health care on Cuba — just not for ordinary Cubans. …there is not just one system, or even two: There are three. The first is for foreigners who come to Cuba specifically for medical care. This is known as “medical tourism.” The tourists pay in hard currency… The second health-care system is for Cuban elites — the Party, the military, official artists and writers, and so on. In the Soviet Union, these people were called the “nomenklatura.” And their system, like the one for medical tourists, is top-notch. Then there is the real Cuban system, the one that ordinary people must use — and it is wretched. Testimony and documentation on the subject are vast. Hospitals and clinics are crumbling. Conditions are so unsanitary, patients may be better off at home, whatever home is. If they do have to go to the hospital, they must bring their own bedsheets, soap, towels, food, light bulbs — even toilet paper. And basic medications are scarce. …The equipment that doctors have to work with is either antiquated or nonexistent. Doctors have been known to reuse latex gloves — there is no choice. …So deplorable is the state of health care in Cuba that old-fashioned diseases are back with a vengeance. These include tuberculosis, leprosy, and typhoid fever. And dengue, another fever, is a particular menace. Wow, I guess shortages extend well beyond toilet paper. Next we have some very sobering data from a 2004 article in Canada’s National Post. And here’s some scholarly research from Katherine Hirschfeld at the University of Oklahoma (h/t: Scott Johnson). …the Cuban government continues to respond to international criticism of its human rights record by citing…praise for its achievements in health and medicine…the unequivocally positive descriptions of the Cuban health care system in the social science literature are somewhat misleading. In the late 1990s, I conducted over nine months of qualitative ethnographic and archival research in Cuba. During that time I shadowed physicians in family health clinics, conducted formal and informal interviews with a number of health professionals, lived in local communities, and sought to participate in everyday life as much as possible. Throughout the course of this research, I found a number of discrepancies between the way the Cuban health care system has been described in the scholarly literature, and the way it appears to be described and experienced by Cubans themselves. …After just a few months of research, …it became increasingly obvious that many Cubans did not appear to have a very positive view of the health care system themselves. A number of people complained to me informally that their doctors were unhelpful, that the best clinics and hospitals only served political elites and that scarce medical supplies were often stolen from hospitals and sold on the black market. Further criticisms were leveled at the politicization of medical care… Public criticism of the government is a crime in Cuba, and penalties are severe. Formally eliciting critical narratives about health care would be viewed as a criminal act both for me as a researcher, and for people who spoke openly with me. …One of the most readily apparent problems with the health care system in Cuba is the severe shortage of medicines, equipment, and other supplies. …Many Cubans (including a number of health professionals) also had serious complaints about the intrusion of politics into medical treatment and health care decision-making. Three academics at Texas Tech University also found very troubling data when they investigated the nation’s health system (h/t: David Henderson). With 11.1% of GDP dedicated to health care and 0.8% of the population working as physicians, a substantial amount of resources is directed towards reducing infant mortality and increasing longevity. An economy with centralized economic planning by government like that of Cuba can force more resources into an industry than its population might desire in order to achieve improved outcomes in that industry at the expense of other goods and services the population might more highly desire. …Physicians are given health outcome targets to meet or face penalties. This provides incentives to manipulate data. Take Cuba’s much praised infant mortality rate for example. In most countries, the ratio of the numbers of neonatal deaths and late fetal deaths stay within a certain range of each other as they have many common causes and determinants. …Cuba, with a ratio of 6, was a clear outlier. This skewed ratio is evidence that physicians likely reclassified early neonatal deaths as late fetal deaths, thus deflating the infant mortality statistics and propping up life expectancy. Cuban doctors were re-categorizing neonatal deaths as late fetal deaths in order for doctors to meet government targets for infant mortality. …Physicians often perform abortions without clear consent of the mother, raising serious issues of medical ethics, when ultrasound reveals fetal abnormalities because ‘otherwise it might raise the infant mortality rate’. …The role of Cuban economic and political oppression in coercing ‘good’ health outcomes merits further study. The bottom line is that Cuba is a hellhole and statistics from a repressive regime can’t be trusted. Though the real message of today’s column is that we should be revolted by people who are willing to be dupes for totalitarianism. And I can understand why people willing to debase themselves in that way are so sensitive to criticism. P.S. The New York Times has a pathetic history of covering up for the crimes of communism, most notably Walter Duranty, who was given a Pulitzer Prize in 1932 even though he despicably lied in his reports to promote Stalin’s horrid regime. He even covered up Stalin’s holocaust of the Ukrainian people. Even though Duranty’s evil actions are now public knowledge, the Pulitzer Prize Board has not revoked the award. The New York Times, to its credit, at least has acknowledged that Duranty lied to promote Stalin’s brutal dictatorship. One wonders if the newspaper eventually will apologize for Kristof. P.P.S. I’m also not impressed that a former Secretary General of the U.N. endorsed Cuba’s health care system. After all, it was an official from the U.N. who praised the lack of obesity among the starving people of North Korea. 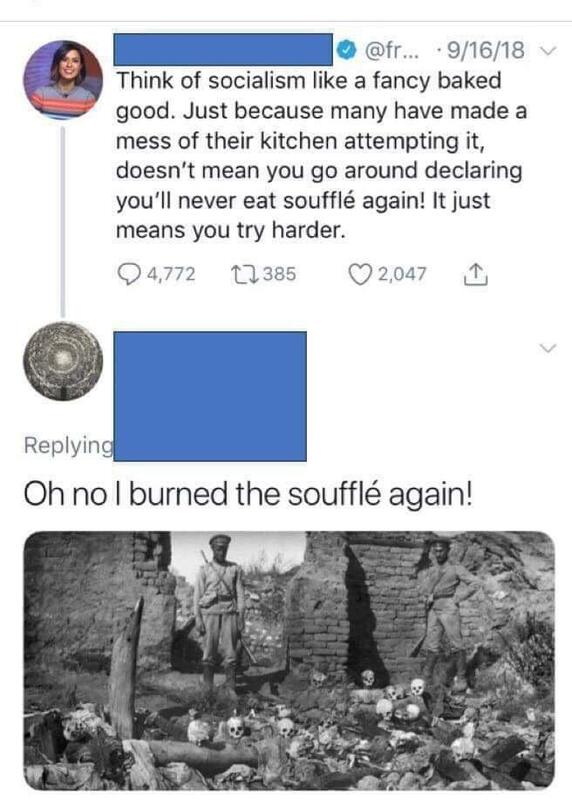 Let’s add to our collection of anti-socialism humor. 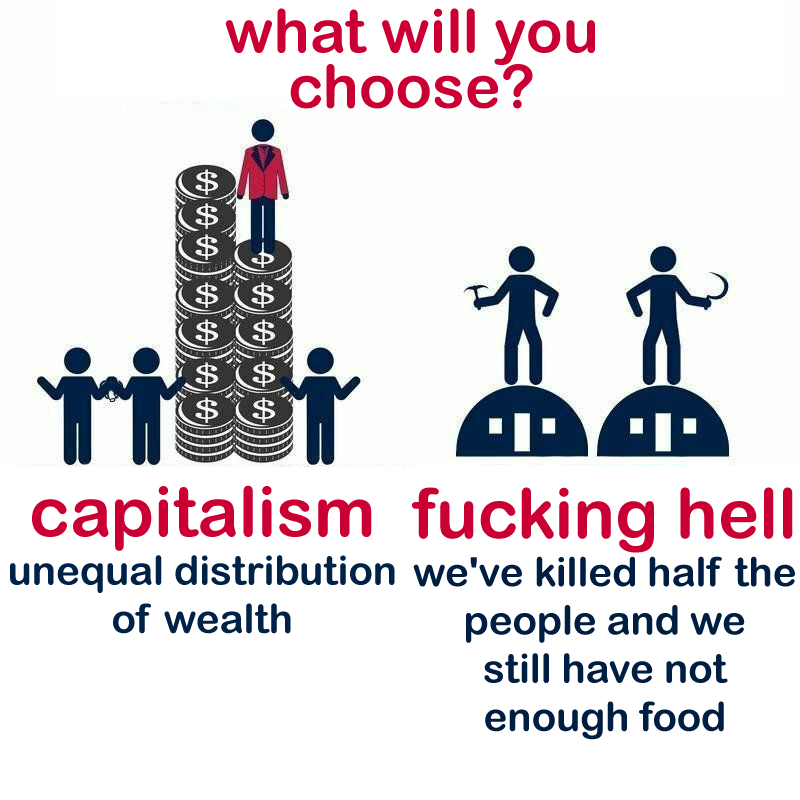 Let’s start with this gem from Libertarian Reddit. But this cartoon helps to show that even the benign form of socialism is a high-risk proposition. But many statists don’t have good intentions, which is the point of this cartoon. 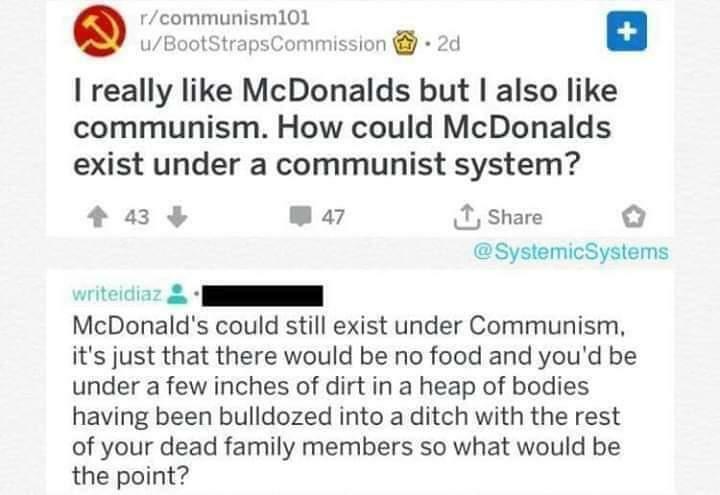 At what point does the left admit that “real communism” is brutality and oppression? Last but not least, whoever put this together deserves credit for a clever bit of satire. 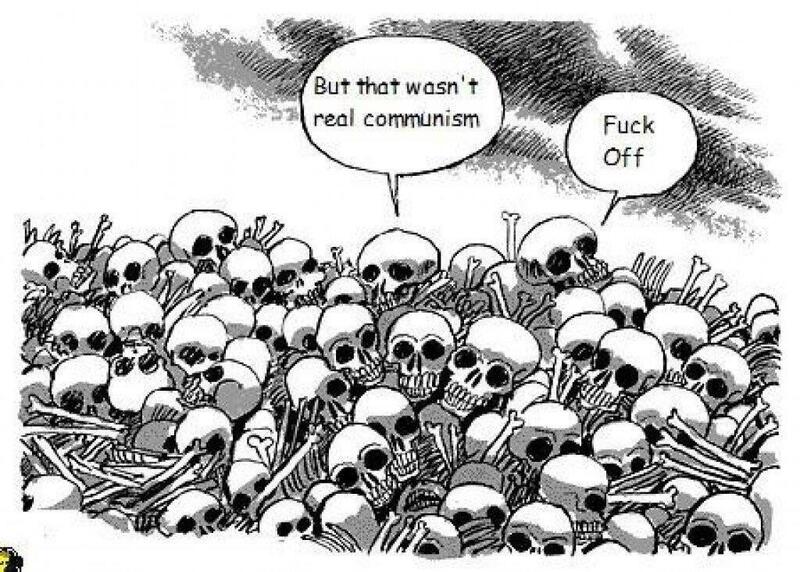 Though I suppose we should be fair and acknowledge that communism “only” killed 100 million people. 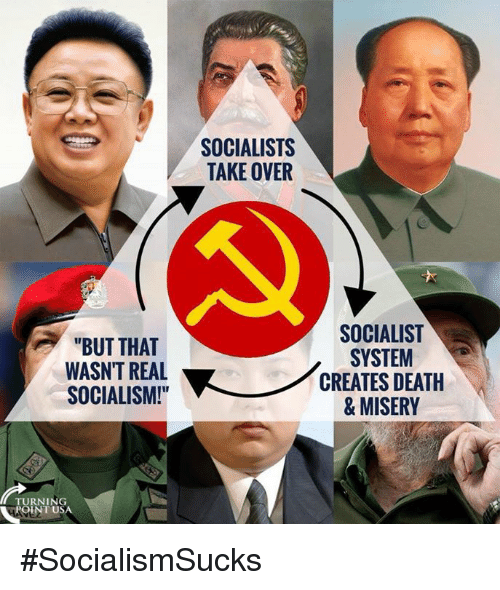 The bottom line is that socialism is always a failure. The only open issue is whether it is the benign version or totalitarian version. 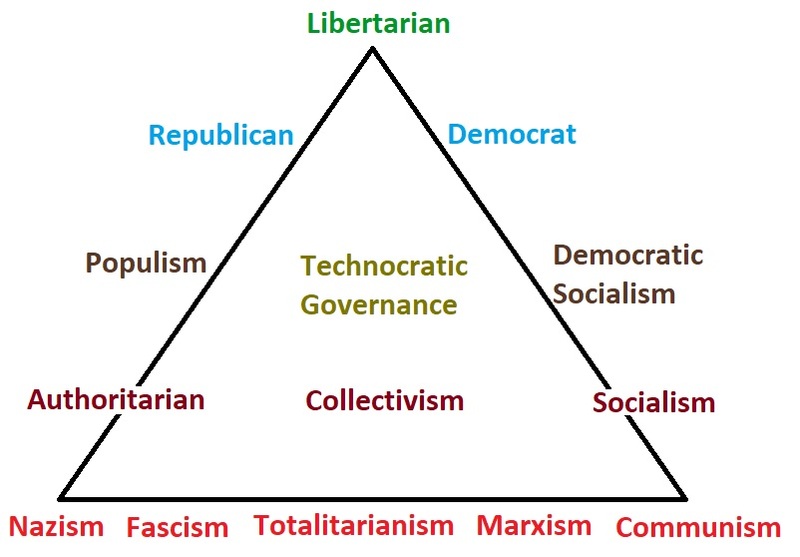 For more on that discussion, I created a flowchart to illustrate different forms of statism.